In the December 8 issue Stephen Bonian, S.J., offers guidance on how to use icons in prayer. 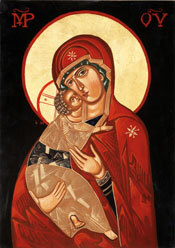 Thanks to the generosity of Trinity Icons, America offers this slideshow of popular icon subjects and themes. To purchase a copy of any of these images, visit Trinitys Web site. This article also appeared in print, under the headline "Praying with Icons," in the December 1, 2008 issue.